These two beetles are often grouped together due to the similarity in their appearance, biology, and behavior. 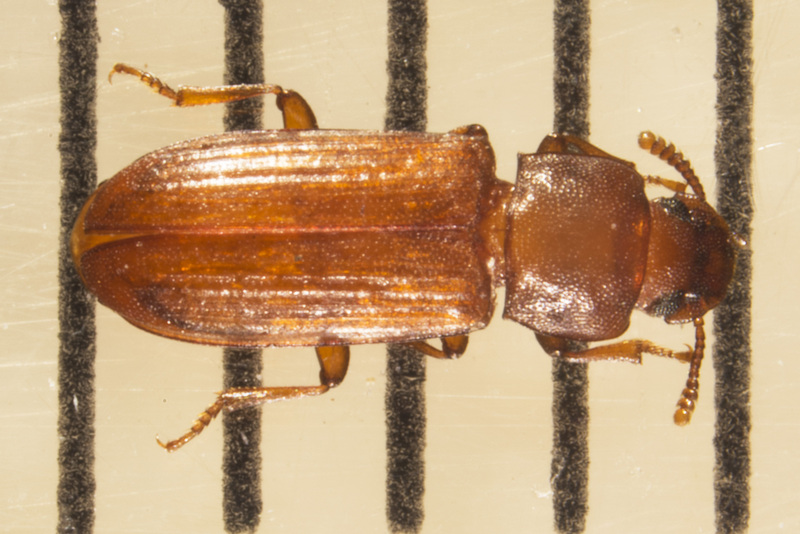 The confused flour beetle was named because of the confusion over its identity. The red flour beetle is named after its rust-red color. The two can be easily separated based on antennal characteristics. The antennae of the red flour beetle is distinctly club-like, with a three-segmented club. The club of the confused flour beetle antennae is four segmented and forms the club gradually. Another slight difference is in the shape of the thorax. The sides of the red flour beetle are curved, whereas the thorax of the confused flour beetle is straight. Both species are cosmopolitan in their distribution. Adult beetles are approximately 3.5 mm (1/7”). Larvae of both species are nearly indistinguishable. They are a light honey color and about 6 mm (1/4”) long. The head and a distinctive forked process at the tip of the abdomen are slightly darkened. Eggs are deposited directly in flour, other food material, or attached to the surface of the container. They are white or colorless and covered by a sticky material to which flour can adhere. Eggs hatch in 3-5 days at 32-35˚C (89.6-95˚F). Larvae burrow into kernels of grain but may leave their burrows in search of more favorable food. There at 5-11 larval instars (7-8 is usual), the variation a result of environment, food, temperature, humidity, or the individual insect. Larvae are fairly active but generally hide within the food, away from light. Pupae are naked, without protection of any form. Development time from egg to adult varies with conditions, however, the average is 26 days at 32-35˚C (89.6-95˚F) and >70% Rh. The minimum, maximum, and optimum temperatures for development of the confused flour beetle are all about 2.5˚C lower than the red flour beetle. Limits of development are imposed mostly by larval mortality, esp. among early instars. The minimum temperature for development is between 20-22˚C (69-71.6˚F), the maximum 37.5-40˚C (99.5-104˚F) when the relative humidity is either low (10-30%) or high (90%). 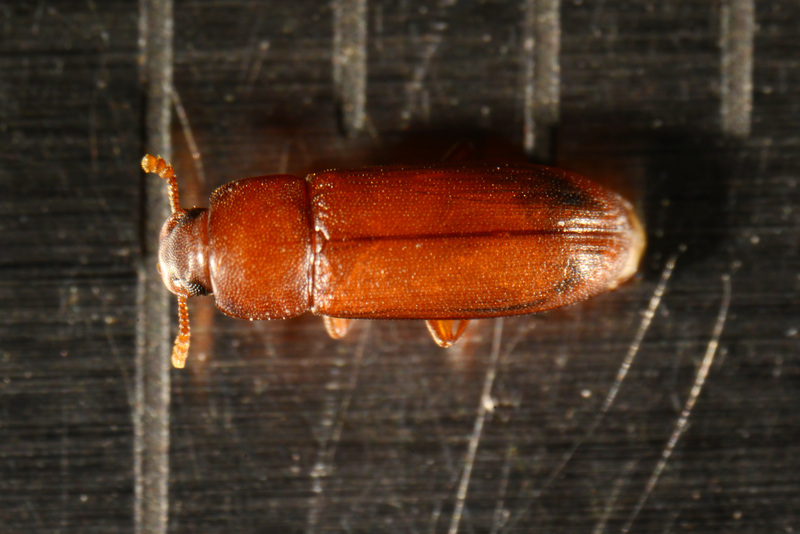 Flour beetles can survive in grain with moisture contents as low as 8%. Average fecundity is 400-500 eggs per female, with peak oviposition occurring during the first week. Adults may live longer than 3 years, and females may lay eggs for more than a year. Adults of both species have well developed wings, but only the red flour beetle has been observed to fly, and it is not a strong flyer. When agitated or crowded, they may secrete chemicals called quinines. These chemicals can cause the infested feed to turn pink and have a pungent odor. 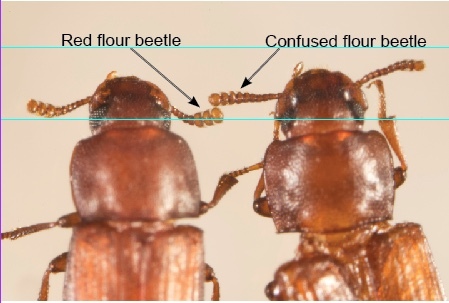 Confused flour beetles have been reported to prefer, and aggregate in flour exposed to quinines, whereas quinines repel red flour beetles. Flour beetles can be found infesting a variety of grain and food materials. They have been reported from grain, flour, and other cereal products, beans, cacao, cottonseed, shelled nuts, dried fruit, dried vegetables, drugs, spices, chocolate, dried milk, animal hides, herbarium and museum specimens. They cannot feed on whole grain, but can feed on broken kernels that are usually present. 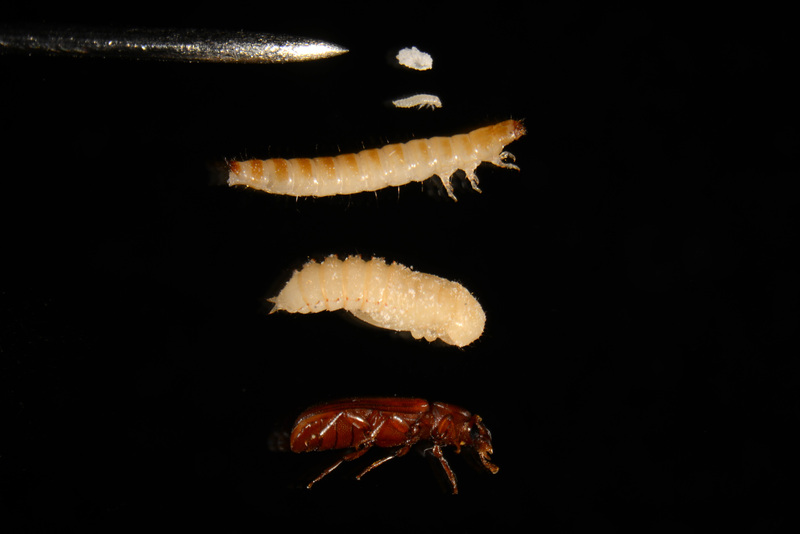 In general, fungi may play a significant role in the nutrition of flour beetles.